I have started to update the Video section so stay tuned for new videos being added on a regular basis! The last two were old Soke Hatsumi and Soke Takamatsu clips. Great finds to those who shared them. The other day I was teaching a small group of students about covert communications, especially after we learned about the massive amount of metadata the government has been allowing the NSA to accumulate secretly. My students asked how could they secretly communicate without using a cell or landline phone and then one of them mentioned about the new Dead Drop activity that is hitting the electronic arena (more on that in a moment). 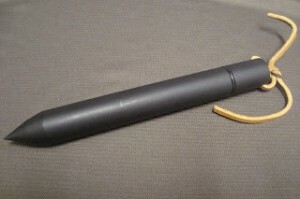 But what I started to show them was another “old school” method called the “Dead Drop” using a metal spike I picked up at a gun show not too long ago. What I did was give a specified location to the students on where to locate the Dead drop and once they found it, there would be details on the rest of the training session(a great orienteering and evasion course) Now of course this would not work in an urban environment, right? Wrong, of course it does there is always a way to set up a dead drop for passing information along to your group. Example: a metal box secured under a payphone, a key holder under a tire wheel well, a fake bolt, fake coin etc. There are hundreds of ways to set this type of communication transfer up. 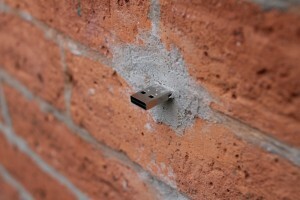 Alright a new Dead Drop that has hit the scene is one where someone is sharing electronic files with oters by placing a memory stick into a wall or crack. All you have to do is come up and download what you need onto your laptop or tablet and off you go! Check out this one: Very cool method to share files and even better if you encrypt it so that only those who have the encryption key can view or extract the information. Alright Ninja Fans, more information for you to add to your practice and training! This entry was posted in Uncategorized on June 8, 2013 by admin. In dealing with personal security for your team, family and or clients, there is often an overlooked area of communication in which to convey a “secret” message, oh yes it is the ubiquitous phone. Whether you are on a cell phone or land line it doesn’t matter, your conversation can be tapped, recorded, intercepted and potentially endanger you or the recipient. So in order to help prevent this from occurring here are a few tips on how to surreptitiously communicate! 1) Remember all call start with a common greeting “hello…” without this your call becomes very easy to flag as suspicious. 2) Set up particular code wor or phrases in advance that both parties know. Ex: Honey, I have the flower project to work on so I’ll be late, translates “there is trouble in our area so I will be there shortly. Whatever you chose make sure it is understood on both ends and not shared with others. 3) Keep it short and simple. This is best, so as not to lead anyone listening that there is actually something being passed between the parties other than a short message. 4) Practice! Make sure each member on the team or the parties know what to do if a code phrase or word is given. Now, I have given a few tips but of course this can be a quite expansive lesson here, so what you need to do is figure out what messages you may want to transfer to your family or team members, bring them into the practice and then start using it. Knowing that there can be trouble and preparing for it in advance gives a ninjutsu practitioner an edge to help his family, friends and himself a significant advantage over his opponents or circumstances. A month of free lessons! Over the last few weeks the country has had very severe storms raging across the states. Devasted homes, lives shattered, but a few..very Ninja Like, are moving on and were prepared to handle these crises. Now here is the lesson: we each live somewhere where a natural or man made disaster can occur at any time, so how have you prepared? As we live in an increasingly electronic world over the next week I want you to create a thumb drive with the following information(encrypted of course) with you Personal and family information! It should contain photographic copies of your passport, social security cards, marriage certificates, bank accounts, 401k etc etc. Mine also contains individual medical information including blood type, allergies and medication information. This is just step 1 my young ninja’s get ready for a whole lot more!